Amanda from Seattle: Hike-a-thon Begins! 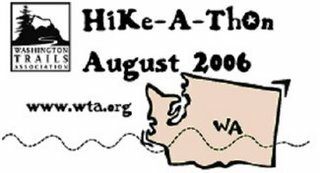 Today is August 1st and the official beginning of the WTA Hike-a-thon. Since I was home from work, I had to get out and get in a few miles today. 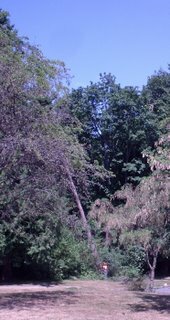 I went to St. Edwards State Park in Kirkland, WA. The land on which Saint Edward State Park sits was once owned by the Roman Catholic Archdiocese of Seattle and was used as a seminary until 1977. When the seminary closed, the land was sold to the State of Washington and the park was created. There are several miles of trails for hiking and mountain biking and at least one mile of trail along the Lake Washington Shoreline. The park was pretty busy today with lots of families with children around the playground and a youth group having a cookout at the picnic area. There was even trail maintenance going on along the drive and I got to see them cut down a dead tree! I hiked a figure eight loop for a total of 3 1/2 miles today.